What Cypher Learning Triggers and Actions are Supported? Certificate Was Awarded to Learner - Triggers when a certificate was awarded to a learner. Order Payment Was Made - Trigger when a payment was made for an order through the e-commerce integration. Learner Unenrolled From Course - Triggers when a learner is unenrolled from a course. Badge Was Awarded to Learner - Triggers when a badge was awarded to a learner. Learner Completed Course - Triggers when a learner completes a course. Subscription Payment Was Made - Triggers when a payment was made for an order through the e-commerce integration. User Was Added to Portal - Triggers when a new user was added to the portal. Learner Enrolled in Course - Triggers when a learner enrolls in a course. Deactivate User - Archive a user. Add User, Then Enroll to Course (From Shopify) - Add a user to your portal and enroll them into the classes they purchased. Reactivate User - Reactivate an archived user. Add User, Then Enroll to Course (General) - Add a user to your portal and enroll them into the classes they purchased. Unenroll User From Course - Remove a user from the specified course/class. Add User - Adds a user to your CYPHER LEARNING portal. When you start creating a Cypher Learning Zap, you will be asked to connect your Cypher Learning account. 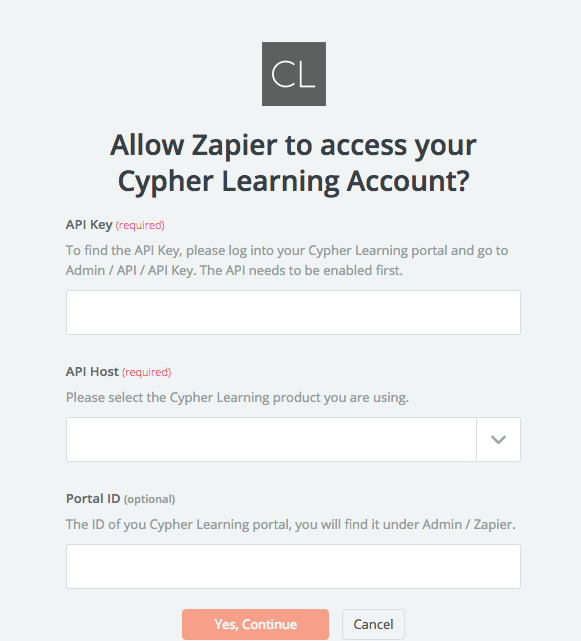 Next, you'll be asked to enter your Cypher Learning API key, API Host and Portal ID. Paste the information into your Zapier account and then “Continue”. If all steps were successful your Cypher Learning account will now be successfully connected.